The Aspira Drainage System drains 67″ faster than the Pleurx Drainage System and the Aspira Drainage System is 71% larger at its narrowest point than the Pleurx Drainage System. 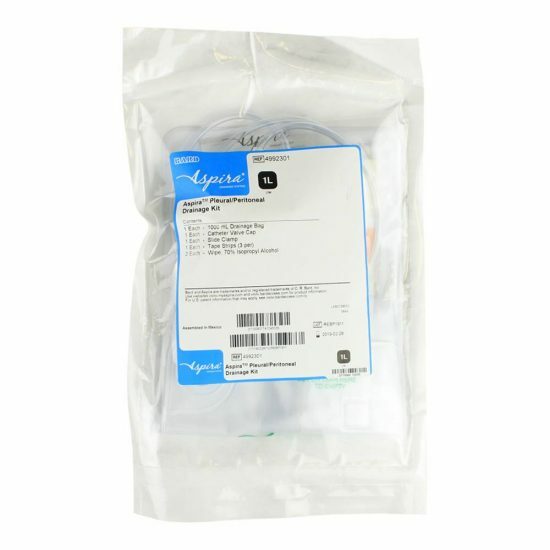 4992208 – Essential Kit comes with Insertion Tray and Catheter. 20 Drainage Kits. 20 Dressing Kits. 4992209 – Starter Kit comes with Insertion Tray and Catheter. 5 Drainage Kits. 5 Dressing Kits.